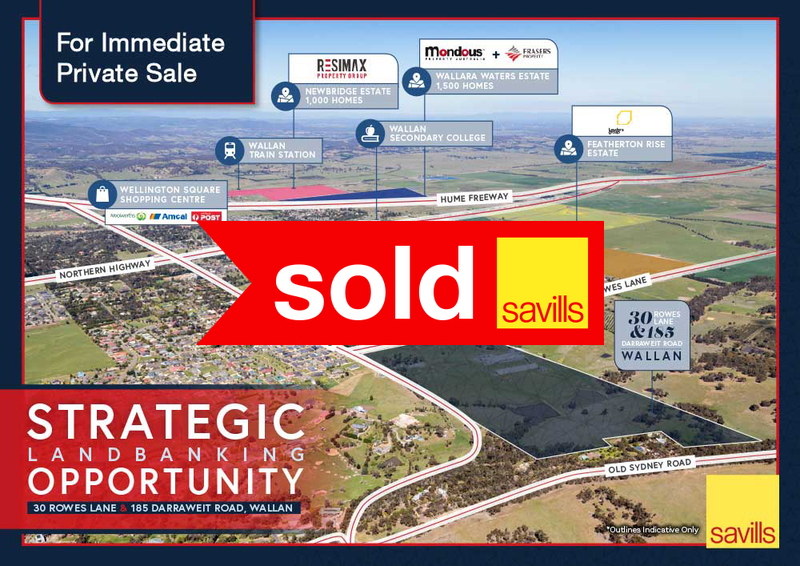 Savills is delighted to offer for sale this incredible landbank opportunity at 30 Rowes Lane & 185 Darraweit Road, Wallan. This key development site is considered a priority site within the forthcoming Wallan South Precinct Structure Plan, and is located within one of the fastest growing municipalities in Australia. This site presents a rare opportunity to purchase a strategic land holding within one of Melbourne’s most sought after growth corridors. The opportunity to secure a key landholding in one of Melbourne’s most prominent growth locations is extremely rare, especially when you consider the size, future growth and proximity to an abundance of surrounding residential, retail and lifestyle amenity. Accordingly, we encourage prospective purchasers to actively consider this outstanding opportunity. 30 Rowes Lane & 185 Darraweit Road, Wallan is For Immediate Private Sale.